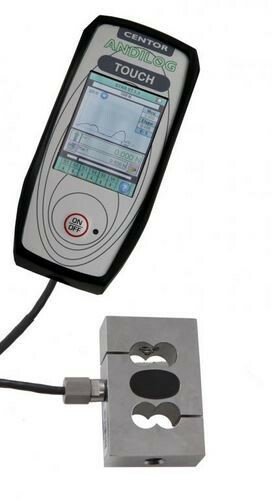 The digital force gauge Centor Touch Star R is the most advanced force gauge currently available, it has become the benchmark tool for force measurement. Besides having all the functionalities of the Centor Easy, it also provides additional handy possibilities: with its graphic capabilities, it can calculate and display in real time, not only the maximum, but also the values of the particular points of the curve, such as the rupture force, force on a trigger, force at a given time, first peak, etc. Mounted with a SBlock model load cell, the Centor Touch Star R can be adapted to fit your force testing application. Furthermore, the Centor Touch Star R model is available with a wide range of remote load cells. Dedicated to your unit, it suits your application with their space limitation and mounting specifications. Find out which remote load cell you need for your Centor Touch Star R digital force gauge by discovering our load cells range. For high capacities, when the measuring space is small or to integrate the load cell in a system, our force gauges Centor Touch Star R fits your needs. The digital force gauge Centor Touch Star R model is the most versatile instrument designed for all tests in industrial surroundings.